“Every lactating mother should have this oil at hand because it helps with milk production and eases colic. It is useful during pregnancy to prevent morning sickness, and is excellent for the traveler, helping to reduce sea sickness and jet lag”, says Light Miller and Bryan Miller in their book Ayurveda and Aromatherapy. Fennel is one remarkable herb with bunch of culinary and remedial benefits that embraces your food with its innate aroma and rich flavor blended with numerous healing attributes. Owing its origin to the coastal Mediterranean region Fennel is botanically called as Foeniculum vulgare. It has been accepted and cultivated worldwide for its enormous benefits that some countries like India, Pakistan and China hold Fennel seeds and its essential oil as an important ingredient of their traditional cooking. With the whole plant serving humanity with its unique qualities, Fennel fruits usually entitled as seeds when dried contributes to the extraction of Fennel seed oil by the process of steam distillation. Bearing anethole as the predominant flavoring substance, Fennel seed oil serves as an aid for various purposes. Fennel is called in Ayurveda as Shatapushpa, which means hundred flowers. It has a long historical use in this ancient healing methodology in the treatment of cold, indigestion, gas, flatulence, PMS, low agni, abscesses, overindulgence in nicotine or alcohol, cramps, colic in children and menstrual problems. Numerous sources state that the Romans, English, Greek and Asians were well known of the extensive healing values of this aromatic herb. With its name engraved in the nine herbs charm practiced in the 10th century, Fennel along with other herbs was intended to treat poisonous infections and other diseases. Referred to as the herb of sight by the ancient Romans, Fennel herb was employed to improve the eyesight of humans and animals. Pliny the Elder, a Roman author and natural philosopher had mentioned in his book ‘The Natural History’ that the serpents would rub against the Fennel herb at the time of shedding off their skin to improve their sight. Fennel herb aids in shedding off the excess fat, the reason for which the Greeks called this herb as Marathon, derived from the word ‘Mariano’ which means ‘to grow thin’. It is interesting to know that the Marathon event conducted in memory of the Greek soldier Pheidippides literally means ‘Land of Fennels’. It possesses excellent appetite suppressing properties that was widely used by soldiers during long journey and by common men while holding religious fasts. Fennel herb was considered to bear the potential of protecting one from witchcraft and driving away the evil forces for which it was hung in the entrance of every home. Since it bears the attribute of strengthening oneself, athletes commonly use fennel seeds as a supplement to provide instant energy and strength. Fennel seed has been used since ages that it has been mentioned in one of the works of Hildegard of Bingen who belonged to the middle ages but was recently crowned as the Doctor of the Church by Pope Benedict XVI for her renowned works in the field of medicine. Fennel seeds and leaves are used in culinary as an aromatic and flavoring element. The Fennel bulbs are used as a vegetable that can be taken raw as well as cooked. It also helps in alleviating womanly health issues and is efficient in boosting up the mental sturdiness thus making one emotionally strong. Fennel seed oil is widely used for its stomachic properties as it aids in digestion thus healing a variety of digestive disorders. Fennel seed oil comprises of numerous chemical constituents of which the majority is anethole. The other components include α-Pinene, Camphene, Sabinene, β-Pinene, Myrcene, phellandrene, o-Cymene, Limonene, Eucalyptol, Terpinene, Fenchone, Linalool, Camphor, Estragole, Fenchyl acetate, Cumic aldehyde and p-Anisaldehyde. Fennel seed oil serves as an excellent source of various healing attributes such as carminative, digestive, stomachic, diuretic, emmenagogue, antispasmodic, antiseptic, depurative, expectorant, galactogogue, anti-diabetic, analgesic, estrogenic, anti-toxic and tonic. Ayurveda is a noble child of the ancient Indian tradition, the country with the world’s oldest historical references. This ancient healing methodology is more than 5,000 years old and is said have mentioned in Atharvaveda, one among the 4 prominent Vedic texts of India. Ayurveda is known as the science of holistic healing that aims at longevity and healthy aging through the use of natural medications and healthy lifestyle. Ayurveda trusts that everything on earth is a part of nature and is made up of the five vital elements of nature namely fire, water, earth, air and space. Leading a harmonious or balanced living with nature supports absolute health and imbalance causes illnesses. Every human being, according to Ayurveda is made up of an unique individual constitution that consists three biological energies known as doshas. Doshas or Ayurvedic body types are nothing but a representation or a combination of the five vital elements. Vata dosha stands for air and space, pitta symbolizes fire and water and kapha represents water and earth. Every individual has a predominance of any one of these doshas and this predominance determines their personality, attributes and behavior. Balance between these biological energies support hale and heartiness and imbalance between these doshas pave way for diseases. Ayurvedic remedies like essential oils, herbs, yoga, meditation, physical exercises, Ayurvedic routine, balanced lifestyle and prayers aim at striking perfect balance between these doshas. Fennel seed oil is said to have equal effects on all the three doshas. Fennel seeds and its essential oil have been proved as amazing natural remedies for all kinds of digestive disorders. It is one of the best accepted carminative oil that assists in expelling gas accumulated in the intestines and prevents the formation of gas thus protecting one from bloating and abdominal cramps due to gas. It is for this reason Fennel seeds are traditionally used in the preparation of gripe water to treat colic in infants and to prevent ulcer and acidity in adults. A 2003 study on the effect of Fennel seed oil emulsion in infantile colic concludes that the use of Fennel oil considerably comforted the infants from colic with no side effects when compared to those who were treated with placebo. Blend 2 drops of Fennel seed oil with 1 ml of sesame oil and massage it on your stomach and abdomen. As a natural stimulant, Fennel oil massage can help in stimulating the secretion of gastric juices and digestive enzymes such as bile and promotes the process of digestion. It also regulates the peristaltic movement of the intestines thus aiding irregular bowel movements and constipation. Moreover, it possesses anti- fungal and anti microbial properties that can effectively kill infectious micro organisms in the intestines. 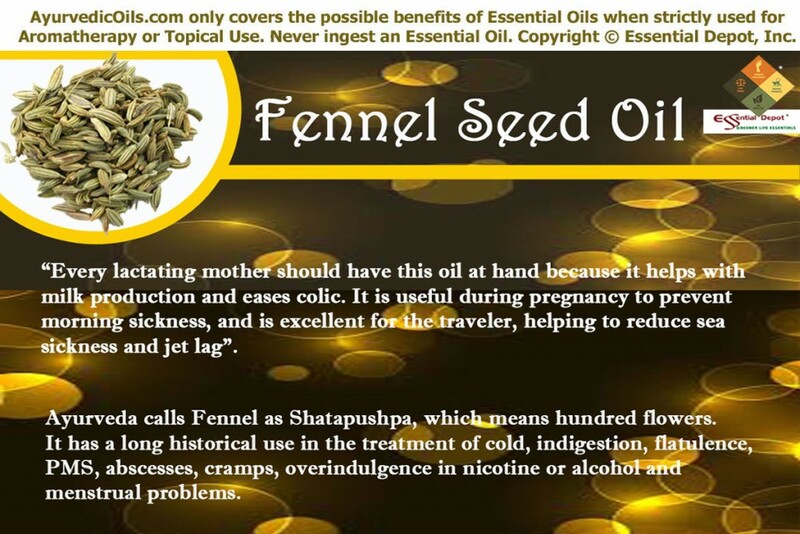 Fennel seed oil has antispasmodic properties that relax the smooth muscles of the intestines and results in quick recovery from pains and abdominal discomfort caused due to indigestion, heartburn, bloating etc. Unlike the other spices, Fennel seed oil has a unique cooling effect that pacifies the intestines and muscles of the stomach and helps in curing stomach ulcer. Thus Fennel essential oil is used in Ayurvedic and Chinese medicine for treating indigestion, gastroenteritis, stomach upset, flatulence and hernias. Rich in anethole, Fennel seeds are used as a trusted mouth freshener in Indian restaurants and homes. Popularly known as Mukhwas meaning mouth freshener, the sweet coated Fennel seeds are used as an after-meal snack. It is for this reason Fennel is often employed in the preparation of toothpaste, liquors, desserts, culinary and mouth fresheners. Add 1 drop of Fennel oil in a cup of warm water and use it as a gargle after meals to keep away from microbes and fight against bad odor or halitosis. Fennel seed oil serves as an excellent respiratory aid with its spicy, peppery and slightly earthy aroma and expectorant properties. Chewing Fennel seeds refreshes your breath and its essential oil assists in treating respiratory tract infections effectively. Fennel seed oil has anti-microbial and expectorant properties that help in fighting against harmful bacteria and viruses that cling to your respiratory tract, resulting in heavy deposits of mucus and phlegm. Adding 2 drops of Fennel oil in steam inhalation or warm bathing water can work wonders in alleviating your respiratory infections as it acts as a natural expectorant, helping in loosening huge deposits of mucus, thus relieving you from all respiratory tract infections such as whooping cough, cold, bronchitis, allergies and breathing difficulties etc. Fennel seed oil possesses female reproductive hormones, which are known to stimulate and regulate the secretion of estrogen in women. Bryan Miller and Light Miller have said in their book Ayurveda and Aromatherapy that Fennel oil is very useful in treating menopause and PMS with its rich content of phyto-estrogens, for which this oil is used frequently in the manufacturing breast tightening and enlarging creams. Gently massage your lower abdomen with 3 drops of Fennel oil blended with 1.5 ml of sweet almond oil for treating irregularities in the menstrual cycle, problems associated with menopause, mood swings, dysmennorhea, blocked menstruation, nervousness and abdominal pain. This massage can also be helpful in facilitating child birth. Fennel seed oil is used after child birth in India mainly to facilitate the removal of toxins from the uterus, support natural contraction of the uterus and also to increase the quantity and quality of the breast milk in lactating mothers. 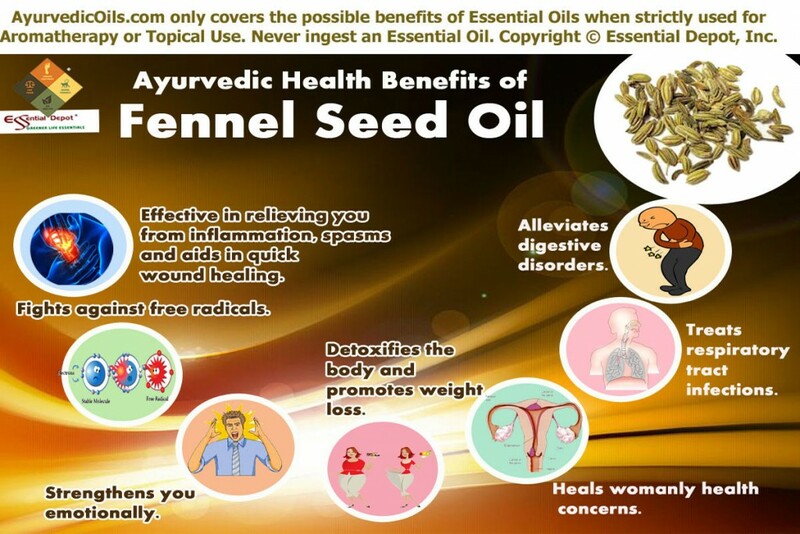 A study on estrogenic property of Fennel seed oil has proved that an acetone extract from fennel seeds had estrogenic effects on the genital organs of male and female rats. Obesity or overweight is one vast roof that can encompass one with a cluster of diseases. Fennel seed oil is an excellent cleansing agent that naturally detoxifies your body by excreting the toxins, excess fluids or water deposits, salt, harmful fats, bad cholesterol and uric acid deposits. Being a diuretic, Fennel oil increases the quantity and regularity of urinating and helps in attenuation of hypertension, treatment of burning or difficult urination and inflammation due to water retention in the body. The sweet and refreshing aroma of this oil suppresses the appetite, thus largely decreasing the longing for food. Add 2 to 3 drops of Fennel oil to your hankie, tissues or air fresheners for decreasing your appetite and granting you a feeling of fullness for a longer duration. Fennel seed oil when added to a massage blend, consisting of 2 drops of this oil with 1 ml of sesame oil works effectively in the filtering toxins from the blood, thus protecting the liver from detrimental toxic substances. Fennel oil has been marked as a useful essential oil in toning the body with its diuretic property and be useful in dealing with obesity. Along with detoxifying, Fennel seed oil also assists in boosting the process of metabolism and suppressing the appetite. This oil also has melatonin, which has the ability of relaxing the muscles, smoothing the nerves and resulting in a sound, peaceful sleep that may help one to control from gaining extra weight and protects from some serious disorders like cardiovascular diseases that results due to obesity. Fennel seed oil helps in relaxing the mind, calming the nerves and pacifying the nervous system. Adding 2 drops of this oil in diffuser or vaporizer aids in getting rid of emotional stress, anxiety and fear. Inhaling this invigorating aroma helps in building up self confidence, enhancing the power of self-acceptance and influencing the qualities of innate love for self and others as well. Along with its ability to help maintain a healthy physique, Fennel seed oil also boosts up your inner spirit and motivates you from within. It is for this dignified cause, athletes often use Fennel seeds as a supplementary for nourishing positive energy and affirmative thoughts. Numerous studies have proved that Fennel seed oil possesses strong anti-oxidant properties that help in the treatment of pharmacological ailments. This property assists in fighting effectively against the free radicals that result in causing aging symptoms and paving way for the growth of cancerous or malignant tumors. As an anti-oxidant, Fennel oil tones the skin by strengthening the connective tissues and efficiently treats wrinkles and the other signs of aging, thus making you to feel younger from within and glow with natural beauty. This attribute is also implemented in oral care for supporting strong teeth and gums. It fights against infections and helps in treating acne, pimples and other skin disorders. Mix 2 drops of Fennel oil with 1 ml of virgin olive oil or jojoba oil and gently massage on wrinkles, dark spots, acne, marks, dull and lifeless skin. This enhances good blood circulation and promotes cellular regeneration. Fennel seed oil is an effective antiseptic, which helps in killing harmful microbes, promotes quick healing of wounds and prevents it from becoming septic. By this way, Fennel oil thwarts the onset of Tetanus, for which it is often used in many ointments and is also used in poultices to treat poisonous bites. It is an excellent source of anti-inflammatory and anti-spasmodic properties. Massaging the affected part with 2 drops of Fennel oil blended with 1 ml of warm sesame oil helps in alleviating inflammation, relieving pain and reducing swelling and promoting blood circulation. This massage also helps in supporting proper functioning of the circulatory system. It is for all these reasons Fennel oil has been used as an effective traditional remedy for rheumatism, arthritis and muscular cramps. Using 3 drops of Fennel oil in hot compress can assist in quicker recovery of spasms and muscle contractions that occur due to hiccups, chronic coughs and epilepsies. Mix 1 drop of Fennel oil with 10 drops of coconut oil and apply it gently on wounds and infections for quicker healing. Fennel seed oil is used to improve eyesight and treat cloudy eyes since ancient times. Even though a 2008 article published in PubMed states that fennel extract is found to be effective in treating rabbits with glaucoma, further research is yet to be done in its application for human beings. Fennel has the power of driving away fleas and its powder is used in kennels and stables. It is used as a preservative in pickles and also in the preservation of fruits and vegetables mainly because of its anti-microbial and anti-fungal properties. It is also used in the manufacture of soaps, disinfectant cleaners and dental products for its antiseptic and aromatic properties. This information is only for the purpose of education and is not intended to diagnose or substitute any prescribed medication or professional medical advice. Do not use essential oils internally and always use essential oils topically in a diluted form, as organic and pure essential oils are highly concentrated substances. Always consult your Ayurvedic practitioner before choosing the suitable essential oil for your unique individual constitution and health condition. The Chemical Composition, Antimicrobial and Antioxidant Activities of Essential Oils from Organically Cultivated Fennel Cultivars published in Molecules. A study on the effect of fennel (Foeniculum Vulgare) seed oil emulsion in infantile colic: a randomized, placebo-controlled study published in PubMed. Fennel published in Drugs.Com- An online drug information site. This entry was posted in Essential Oils - Learn About and Purchase and tagged Ayurvedic health benefits of Fennel seed oil, Ayurvedic oils for aging problems, Ayurvedic oils for bronchitis, Ayurvedic oils for cold, Ayurvedic oils for colic, Ayurvedic oils for digestive problems, Ayurvedic oils for indigestion, Ayurvedic oils for inflammation, Ayurvedic oils for lactating mothers, Ayurvedic oils for menopause, Ayurvedic oils for obesity, Ayurvedic oils for PMS, Ayurvedic oils for stress, Ayurvedic oils for weight loss, Ayurvedic oils for wrinkles, Chemical constituents of Fennel seed oil, Fennel in Ayurveda, Foeniculum vulgare, Health benefits of Fennel seed oil, Therapeutic properties of Fennel seed oil by AyurvedicOils. Bookmark the permalink.